A House investigation into improper intelligence gathering gained momentum this week after subpoenas were issued for records on three Obama administration political appointees. U.S. officials said the House Permanent Select Committee on Intelligence this week ordered the National Security Agency, FBI, and CIA to produce records on all requests made by the three senior officials for the names of Americans redacted in electronic intercepts of conversations of foreign officials, said U.S. officials familiar with the matter. The newest target of the investigation that began in March is former U.S. Ambassador to the United Nations Samantha Power, a long-time Obama confidant. The other two being probed as part of the committee's investigation into potentially improper political spying are former CIA Director John Brennan and former White House National Security Adviser Susan Rice. Power declined to comment through a spokesman. Rice and Brennan did not return emails seeking comment. The subpoenas were issued Wednesday by Committee Chairman Rep. Devin Nunes (R., Calif.), who in April revealed that "dozens" of classified intelligence reports appeared to have improperly unmasked the names of Americans inadvertently spied on during foreign intelligence surveillance operations. Nunes was sidelined from the committee's Russia inquiry after a leftist media monitoring group alleged he disclosed classified information. The House Ethics Committee has launched an inquiry into the allegation. However, the ethics panel so far has ignored similar allegations lodged against the committee's ranking member, Rep. Adam Schiff (D., Calif.), who appears to have disclosed classified information in public discussion of former White House National Security Adviser Michael Flynn’s intercepted conversation with the Russian ambassador. The committee wants the three agencies to disclose the details about the three former officials' requests of the agencies to provide the hidden identities of the Americans who were caught in electronic surveillance. The investigation into unmasking activities of Americans was initially part of the intelligence oversight panel's investigation of Russian political influence operations during the 2016 election. In addition to the subpoenas for unmasking request records, the committee also issued four related to the Russia aspect of the probe. They include notices to former White House National Security Adviser Flynn and Michael Cohen, President Trump's personal lawyer. The issuing of subpoenas related to the disclosure of Americans' identities are a sign that the probe into the potential political spying by the Obama administration has been elevated. The NSA, FBI, and CIA have provided some cooperation to the committee but so far have not provided details sought by investigators. The subpoenas are meant to compel the three agencies' cooperation on the matter. Procedures for electronic intercepts that incidentally spy on Americans require blacking out the names of the Americans in a bid to protect privacy rights. In cases usually limited to those involving terrorists or foreign intelligence operatives communicating with Americans, senior government officials can request that hidden names contained in raw transcripts be revealed in order to better understand the context of conversations. The unmasking is restricted to officials with a need to know and the dissemination of the revealed names is supposed to be limited within intelligence and government agencies. House investigators believe the Obama administration sought to exploit the intelligence reports by first obtaining the masked names and then widely disseminating the reports in a bid to make identifying any leaks to the press more difficult. "It's clear that people on the Hill have found indications that high-level officials of the Obama administration weaponized American intelligence," said a senior U.S. official. The officials said the probe into possible political intelligence gathering by the Obama administration is now a separate inquiry from the Russia probe that has been dominating major news outlets' coverage over the past several weeks. By contrast, the improper unmasking activities have been largely ignored by most news media that have instead focused extensive coverage on the Russian collusion allegations. The Senate Intelligence Committee is also investigating the matter but its inquiry appears to be limited to the Russia allegations. Former FBI Director James Comey, who was fired by President Trump in part for continuing the Russian counterintelligence investigation, is set to testify before the Senate panel Thursday. Trump, who has called the collusion allegations "fake news," joined the fray on Thursday, tweeting, "The big story is the ‘unmasking and surveillance' of people that took place during the Obama Administration." Indications of a political spying operation against Trump and his associates first surfaced in March when intelligence officials told the New York Times that during the last days of the Obama administration, White House officials had "scrambled to spread information" about Russian hacking and collusion with Trump campaign officials. The March 1 report said American intelligence agencies had eavesdropped on communications of Russian officials, including some inside the Kremlin, discussing contacts with Trump aides. House investigators' concerns also were raised by earlier press disclosures revealing the contents of an intercepted phone call between Flynn and Moscow's ambassador to the United States, Sergey Kislyak, discussing U.S. sanctions on Russia. Flynn later resigned as White House national security adviser as a result of the disclosures. Power, the former UN ambassador targeted by the unmasking investigation, worked as an aide to Obama in the Senate and then on the White House National Security Council staff from 2009 to 2013. She became U.N. ambassador in 2013 and was a key figure in advocating U.S. military intervention in Libya. The United Nations is a major U.S. intelligence target for the NSA, FBI, and CIA and investigators believe it is unusual for Power to have asked for the identities of Americans in late 2016 and early 2017. Rice, the former White House adviser, earlier this month told CNN she would not testify before a Senate subcommittee investigating the Russia. Rice called allegations she misused intelligence "absolutely false." "I did my job which was to protect the American people and I did it faithfully and to the best of my ability," she said. "And never did I do anything that was untoward with respect to the intelligence I received." 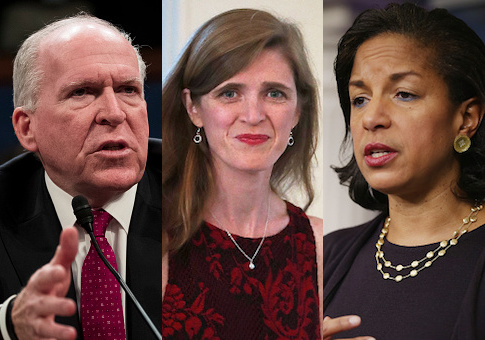 On May 23, Brennan revealed in House testimony that he had made unmasking requests during his tenure, but did not ask for the names of Americans in classified intelligence reports on Jan. 20, the day he left CIA. "No, I was not in the agency on the last day I was employed," Brennan said. "I definitely know that on the last day I was employed I definitely did not make such a request." Brennan, a career CIA analyst who also worked closely with Obama in the White House before moving to CIA, disclosed during his testimony that he requested that the FBI investigate Trump associates during the 2016 presidential campaign after intelligence reports indicated ties between campaign aides and Russians. Critics have charged Brennan with politicizing the CIA during his tenure as director, limiting the agency's espionage capabilities. Brennan said he asked the FBI to investigate because he was worried by intelligence reports of contacts between Russians and Americans he did not identify in the May 23 testimony. "And so therefore I felt as though the FBI investigation was certainly well-founded and needed to look into those issues," he said. On March 20 during testimony before the House intelligence panel, then-FBI Director Comey and NSA Director Adm. Mike Rogers both testified they had no information supporting claims by Trump that the Obama administration had conducted political surveillance of him and his aides. Days later, Nunes said he has been shown dozens of classified intelligence reports that appeared to contradict the two officials' testimony. The intelligence reports included transcripts of communications, including communications directly from Trump based on a foreign electronic spying operation between November and January—the period when the transition team was operating, mainly from Trump's New York residence, Trump Tower. Nunes has said the apparent political spying activities were based on intercepts of a foreign target and were not related to the Russia inquiry. This entry was posted in National Security and tagged CIA, FBI, Russia. Bookmark the permalink.